Xanth was the enchanted land where magic ruled—where every citizen had a special spell only he could cast. It was a land of centaurs and dragons and basilisks. For Bink of North Village, however, Xanth was no fairy tale. He alone had no magic. And unless he got some—and got some fast!—he would be exiled. Forever. But the Good Magician Humfrey was convinced that Bink did indeed have magic. In fact, both Beauregard the genie and the magic wall chart insisted that Bink had magic. Magic as powerful as any possessed by the King or by Good Magician Humfrey—or even by the Evil Magician Trent. Be that as it may, no one could fathom the nature of Bink’s very special magic. Bink was in despair. This was even worse than having no magic at all . . . and he would still be exiled! Thus begins Piers Anthony’s enthralling Xanth series. . . .
Piers Anthony, sometimes called Pier Xanthony, is the pseudonym of a Mundane character who was born in England in 1934, came to America in 1940, was naturalized in 1958, and moved to Xanth in 1977. His first story was published in 1963, and his first novel, Chthon, in 1967. His first Xanth novel, A Spell for Chameleon, won the August Derleth Fantasy Award as the best novel for 1977, and his fantasy novels began placing on the New York Times bestseller list with Ogre, Ogre. 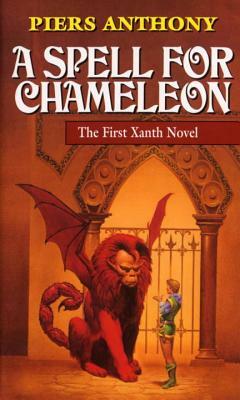 He shifted from writing in pencil to writing on the computer, and Golem in the Gears was his first novel created on the machine; naturally, the computer found its way into Xanth.